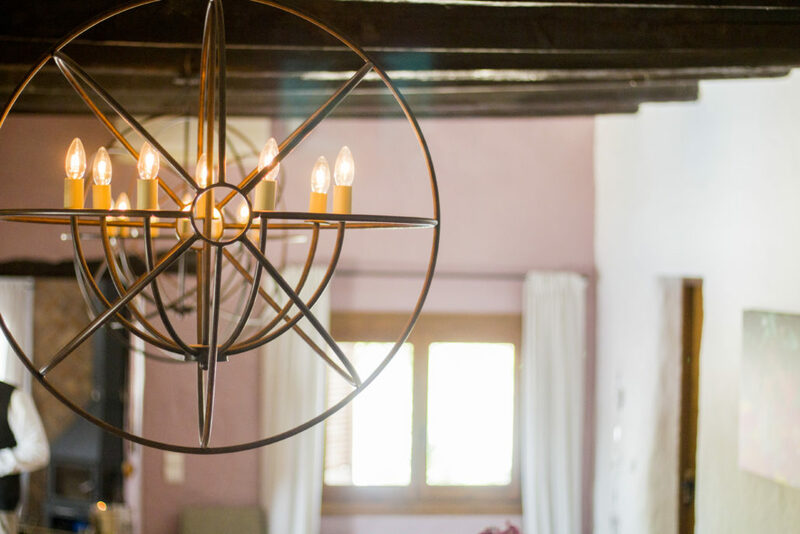 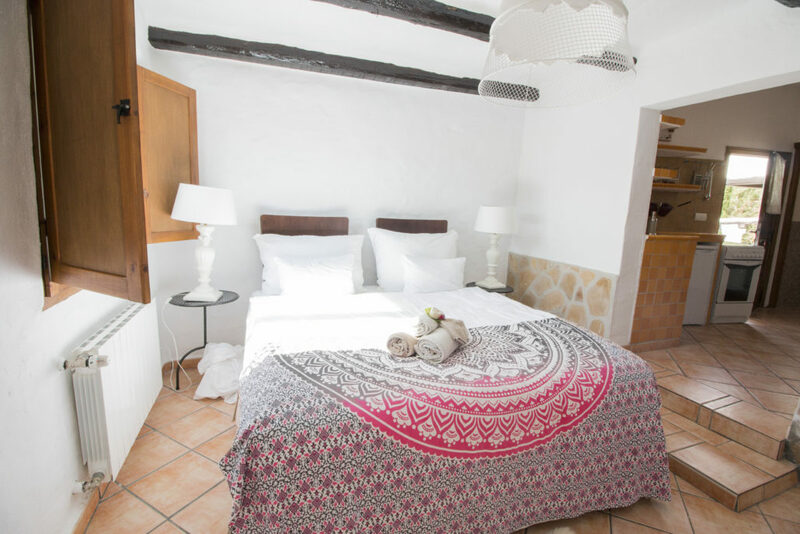 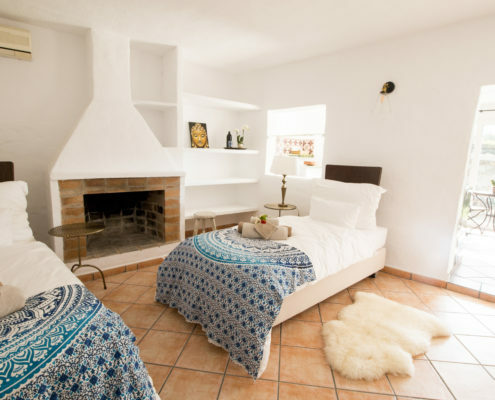 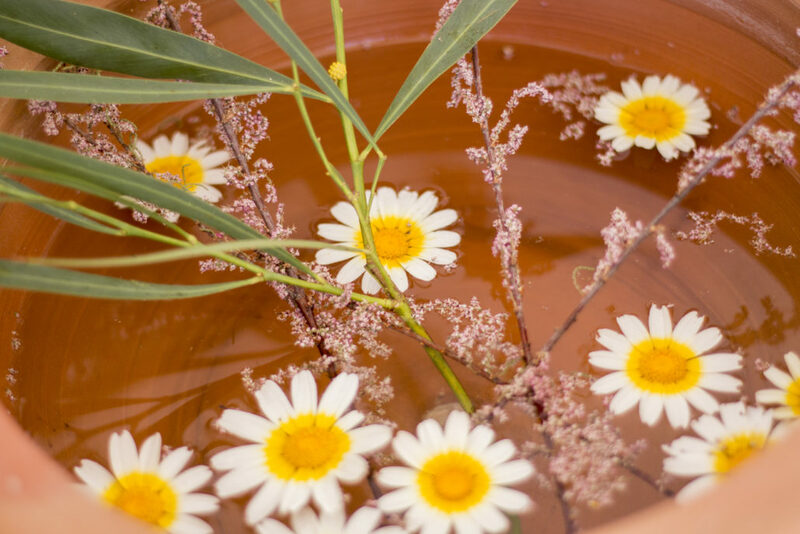 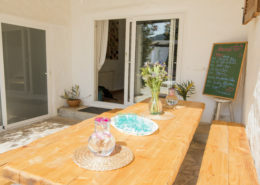 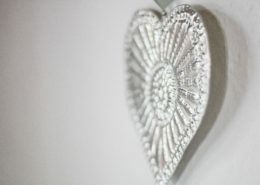 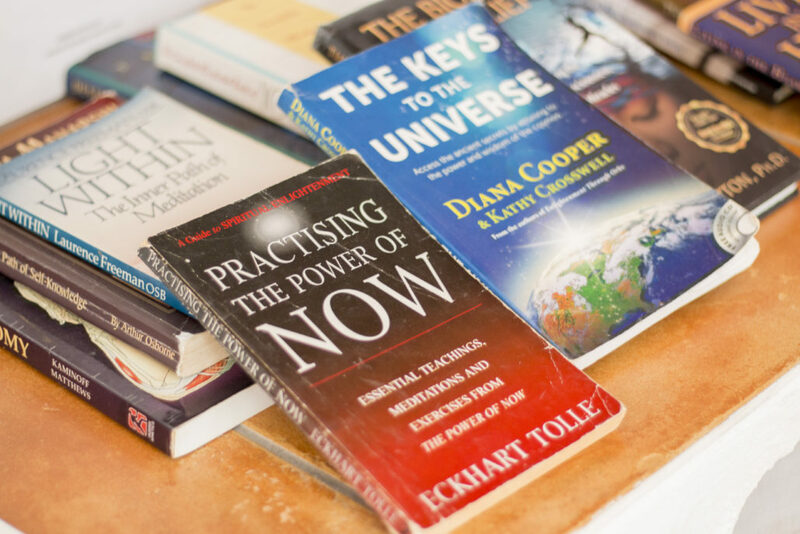 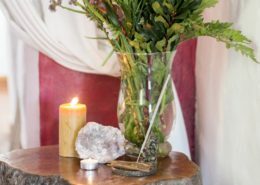 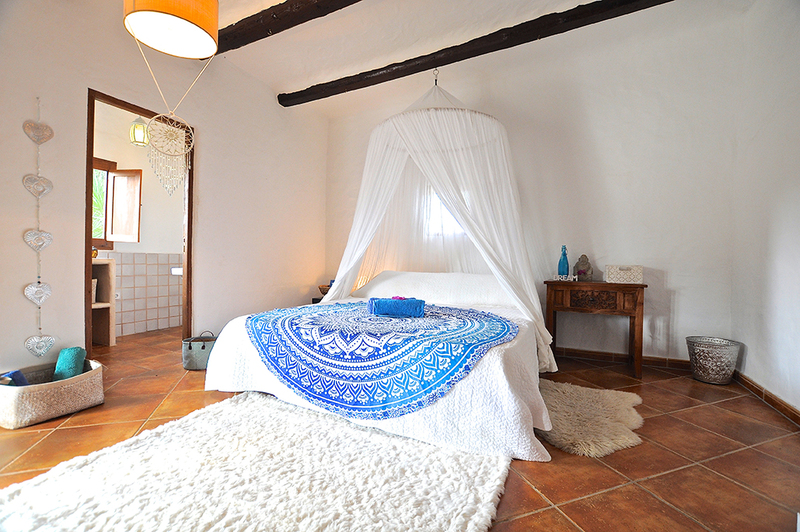 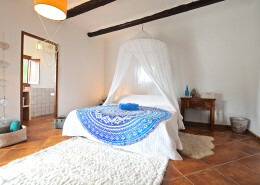 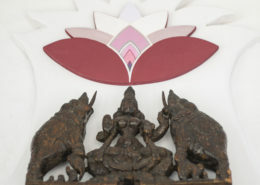 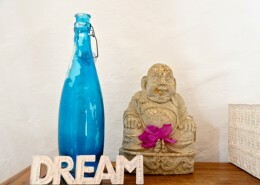 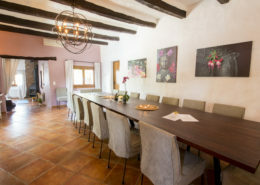 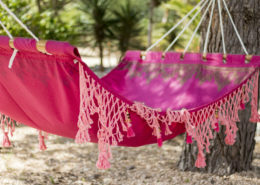 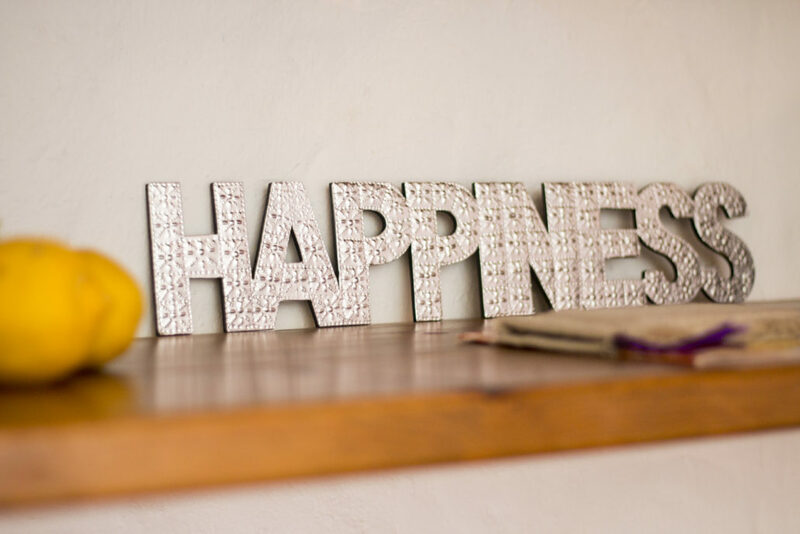 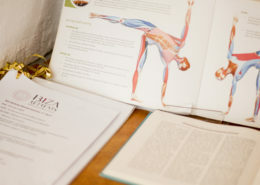 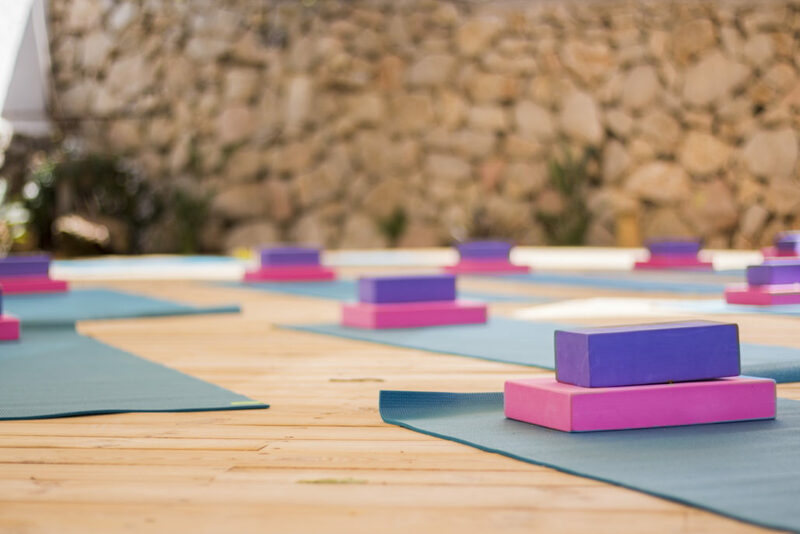 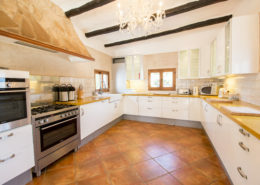 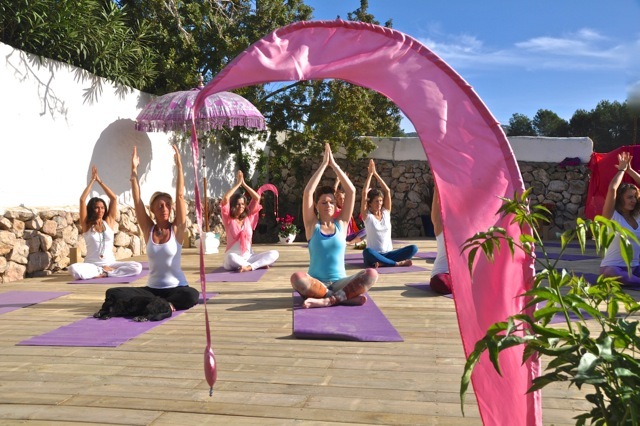 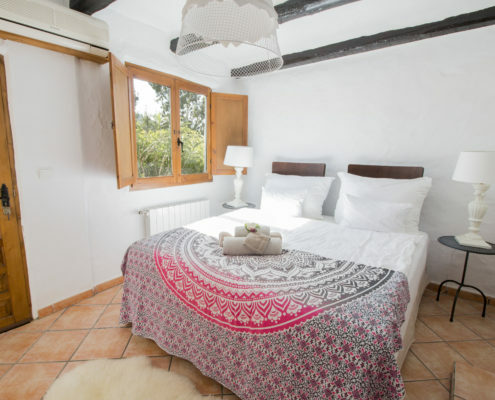 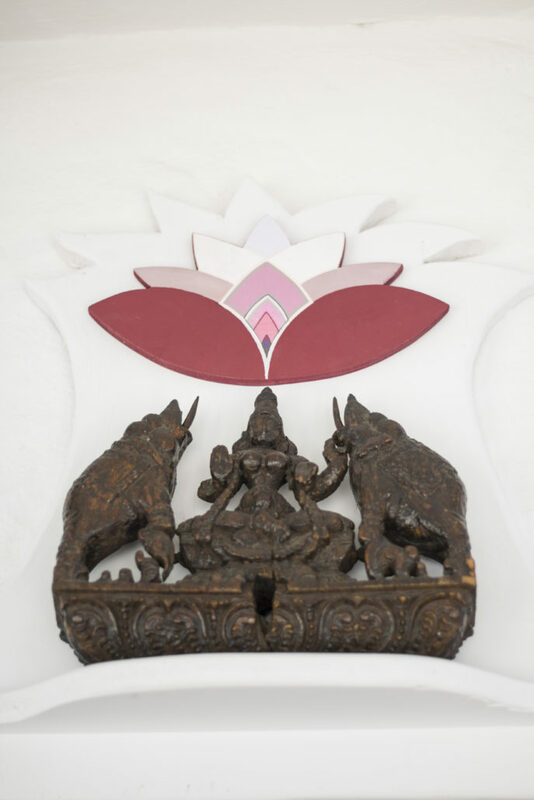 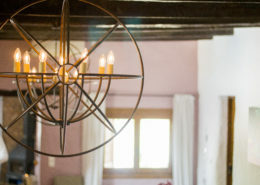 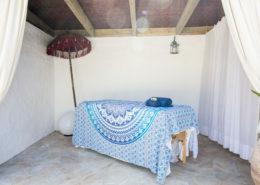 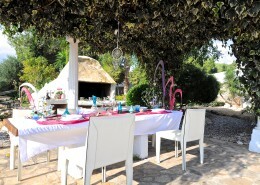 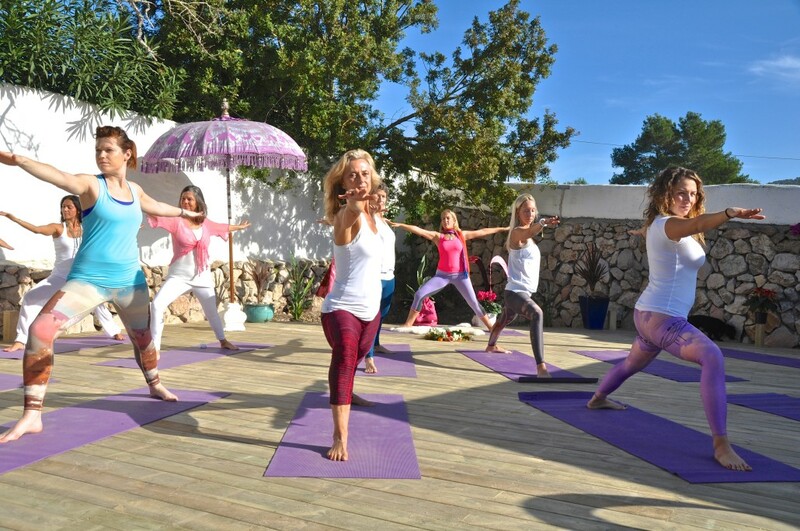 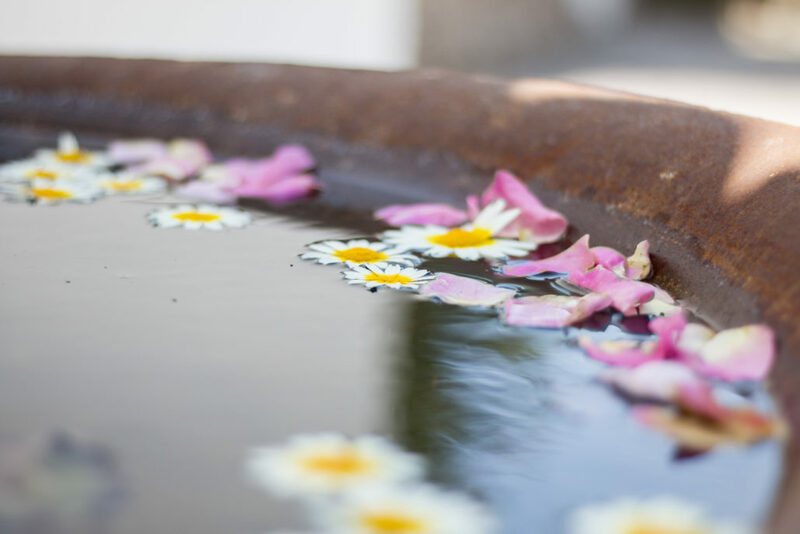 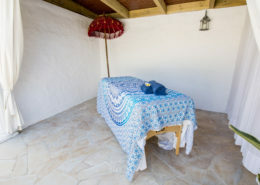 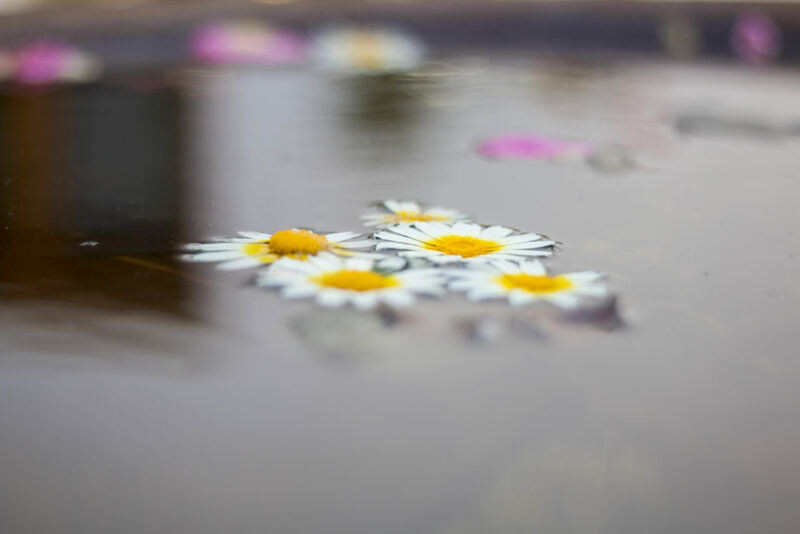 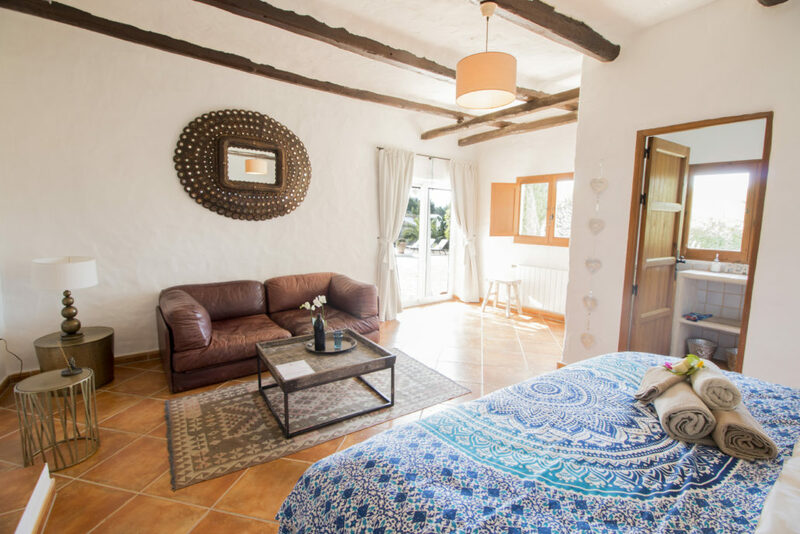 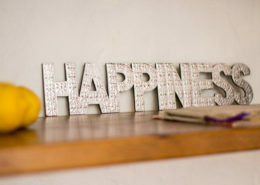 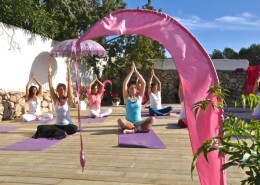 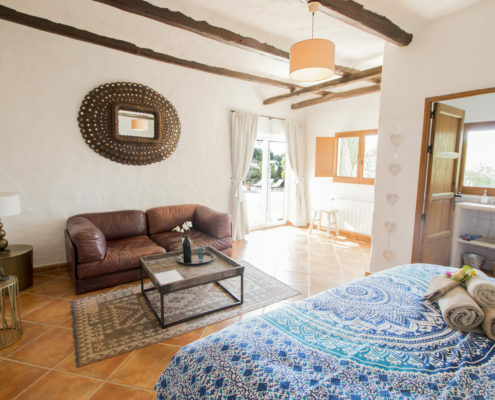 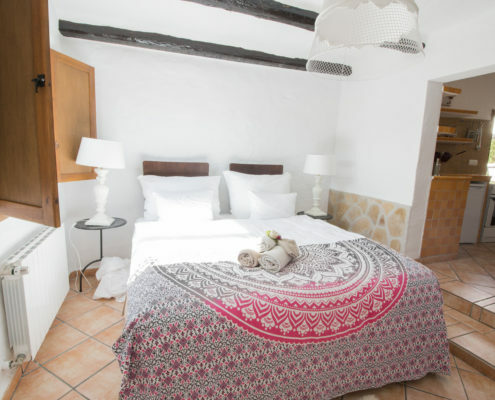 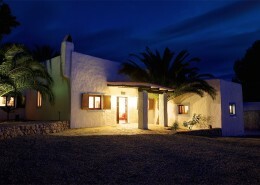 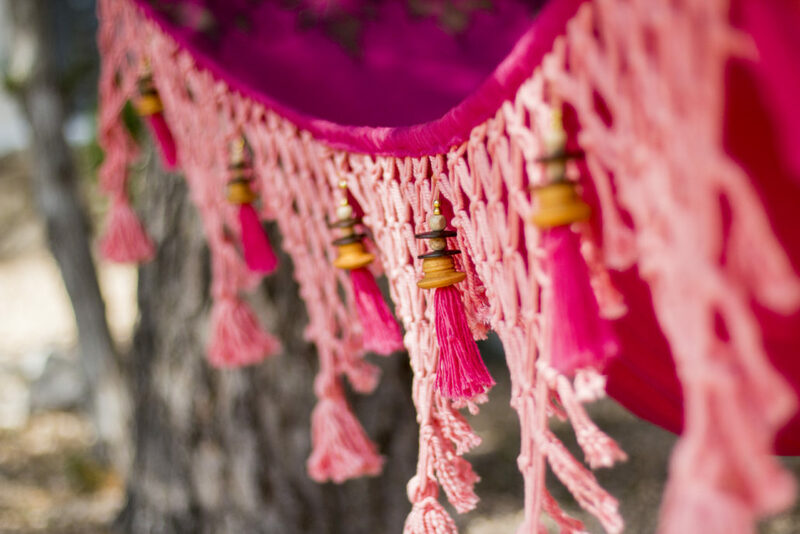 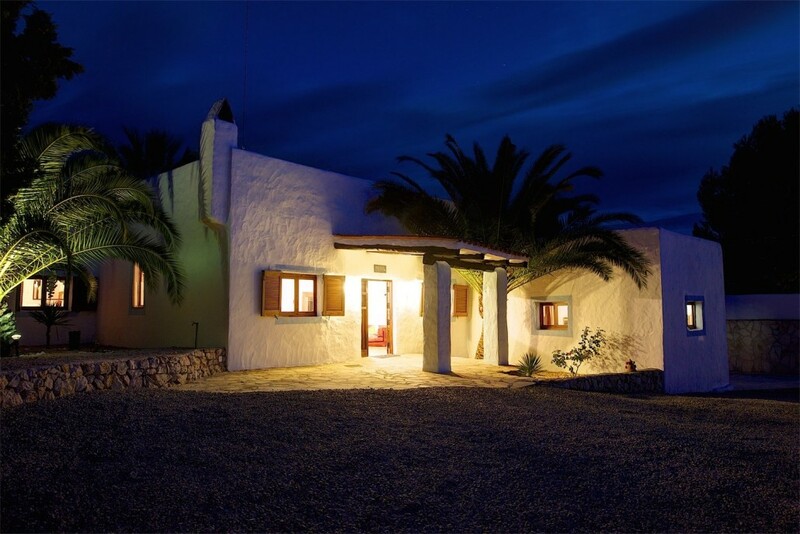 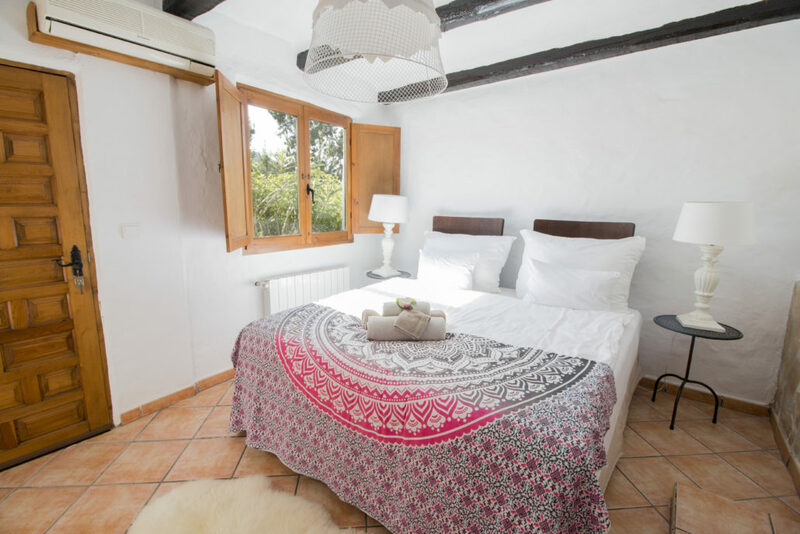 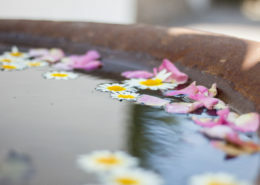 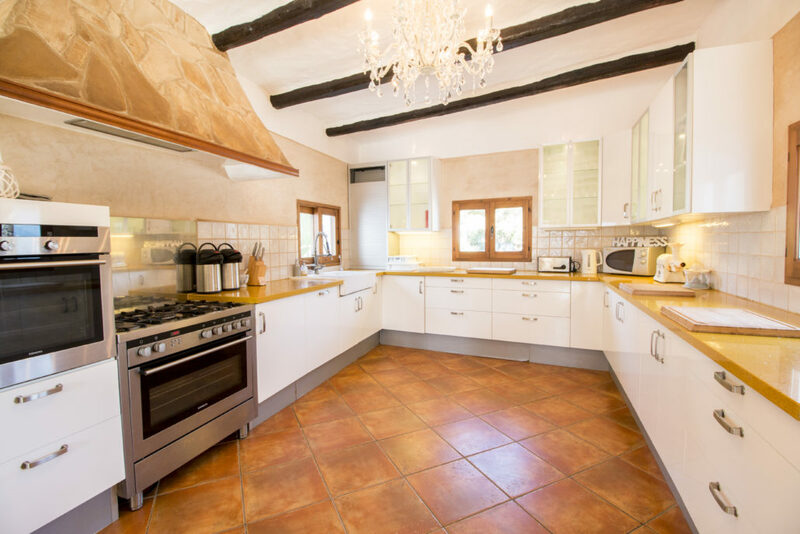 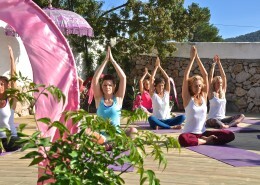 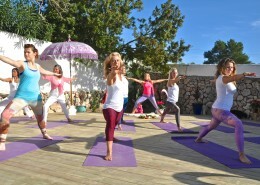 Welcome to Casa Lakshmi Luz – Boutique Yoga B & B for all the family! 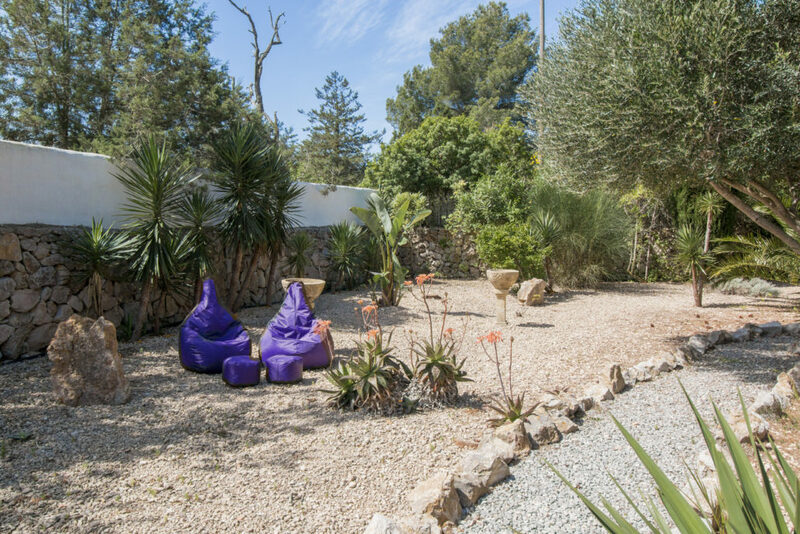 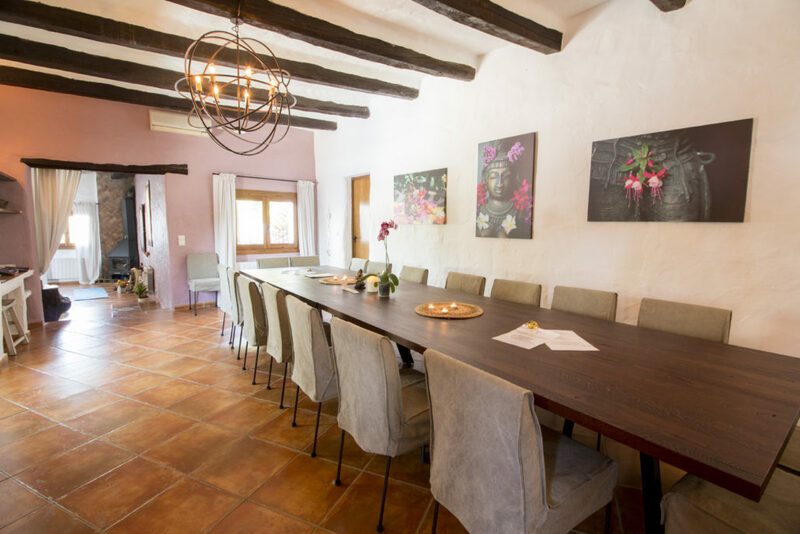 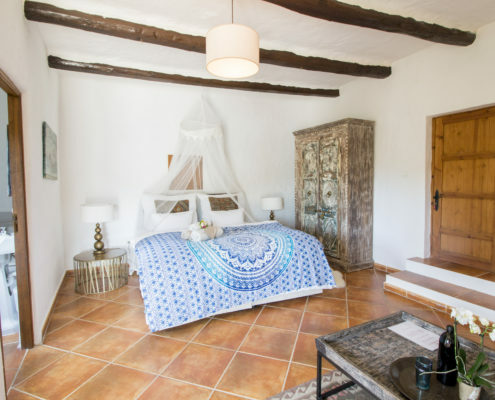 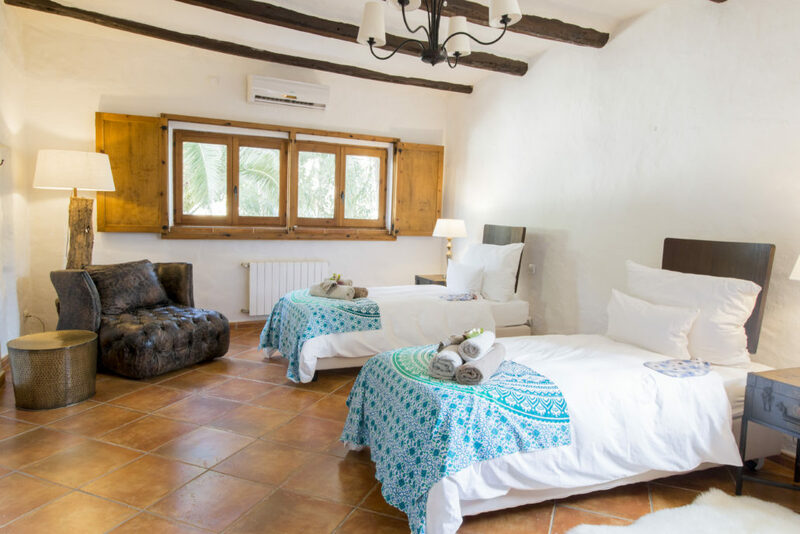 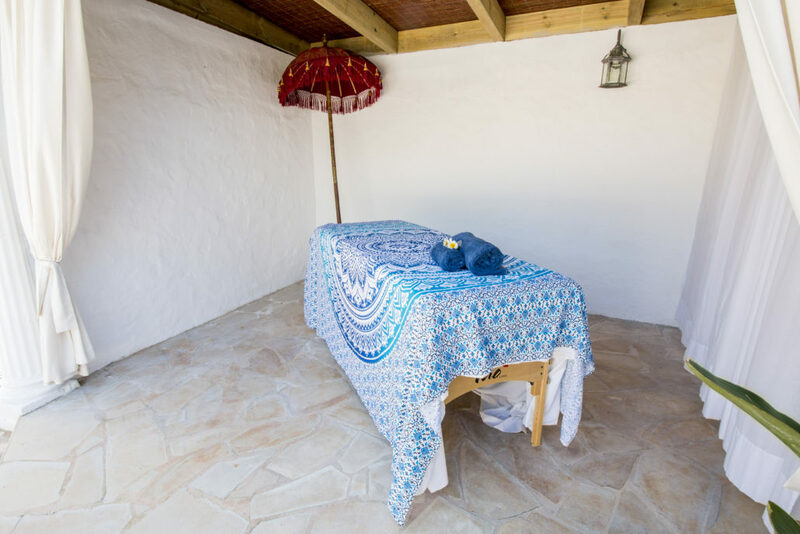 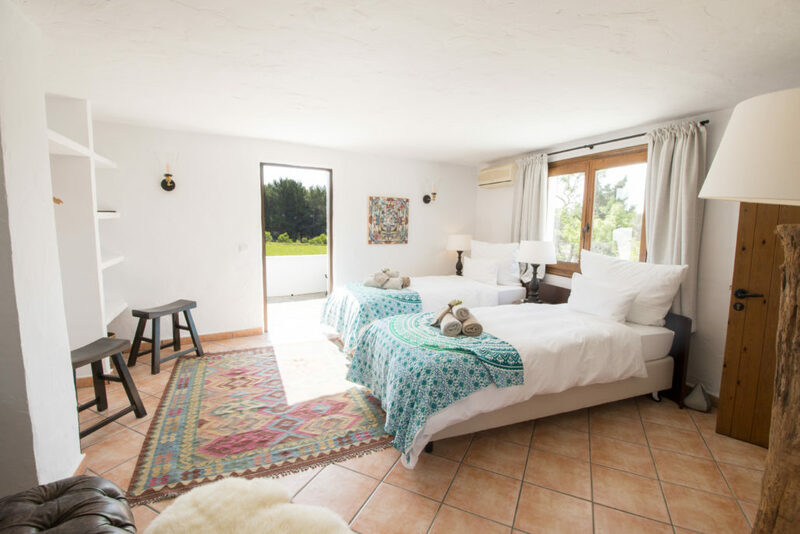 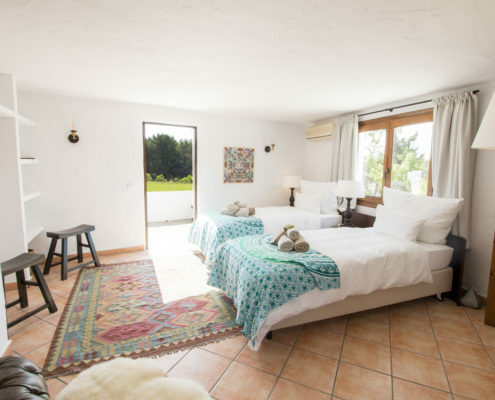 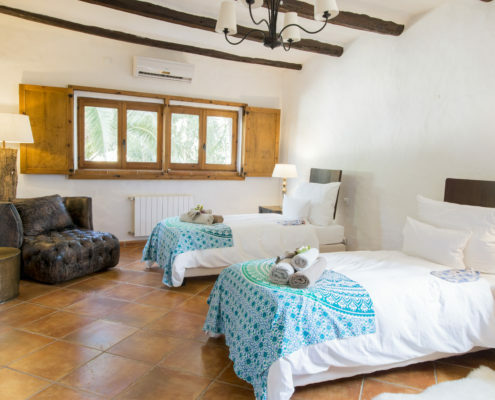 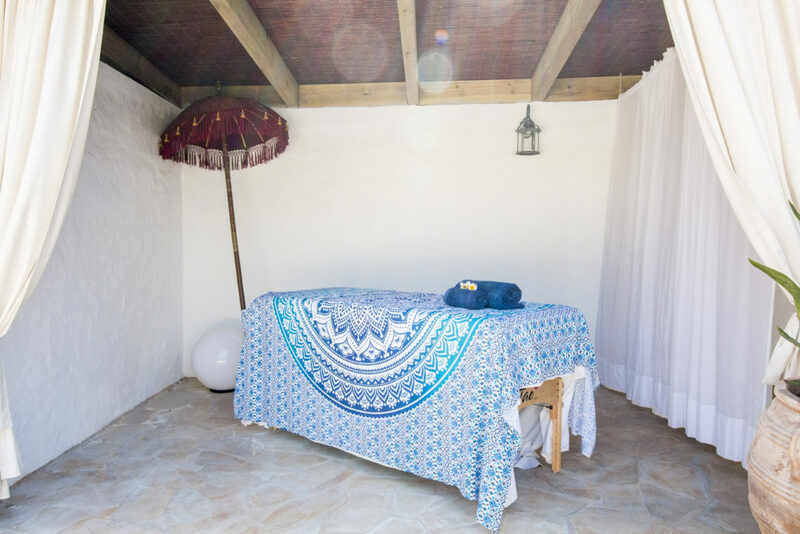 With 7 bedrooms, this is a boutique retreatful experience, for friends and family this August 5 – 27th – a lighter form of retreat or a healthier and more relaxing form of Ibizan summer holiday! 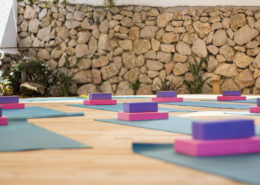 And to help you to ease into your healthy holiday, the prices include accommodation, delicious healthy breakfast, morning yoga and one massage per week for each adult and on hand, should you wish for more rejuvenation and pampering are our wellness team to coordinate further treatments & therapies and – of course – as Island experts, our concierges can tune you into the most beautiful beaches, cafes, restaurants and sunset experiences, for all the family, that our magical Ibiza has to offer. 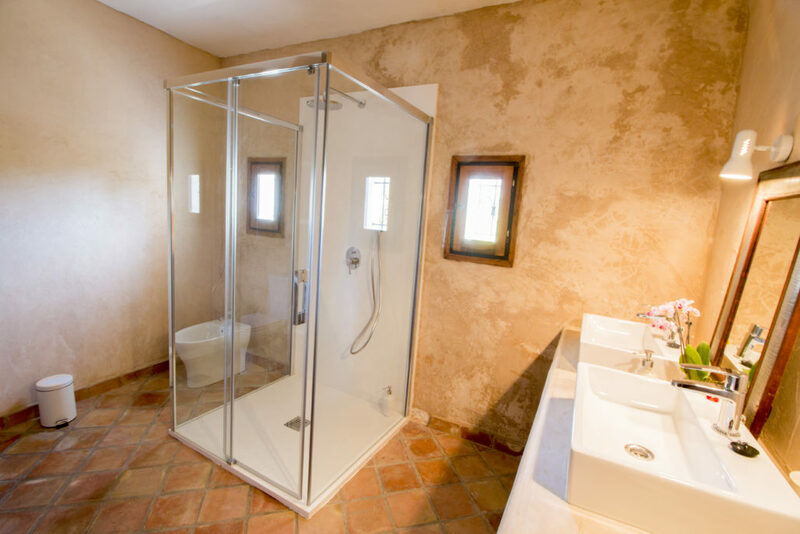 2 sumptuous single rooms with double beds and a shared, heavenly bathroom, newly reformed with stunning rain shower (gold & silver). 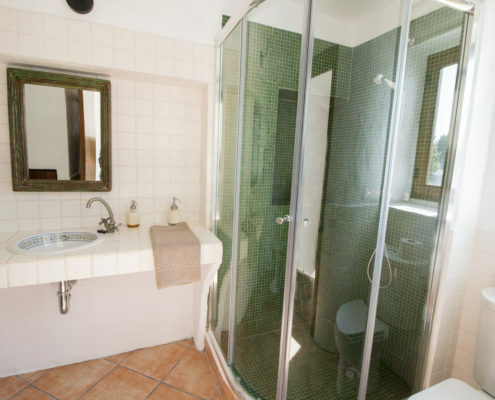 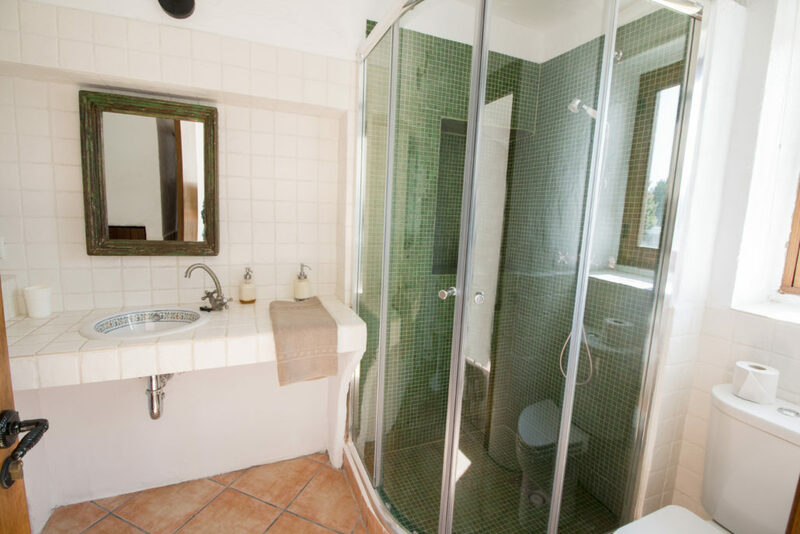 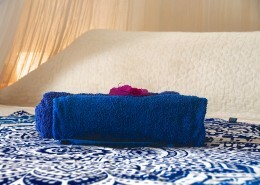 2 spacious twin rooms or double rooms for single occupancy with ensuite bathrooms (emerald and sapphire). 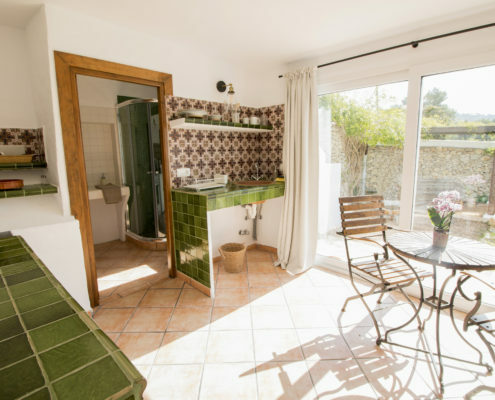 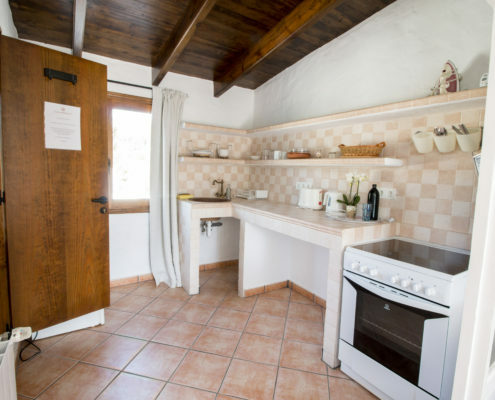 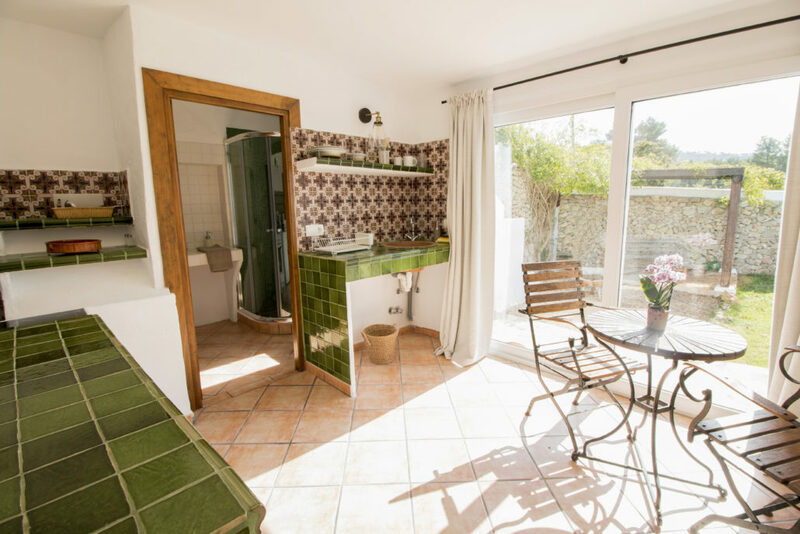 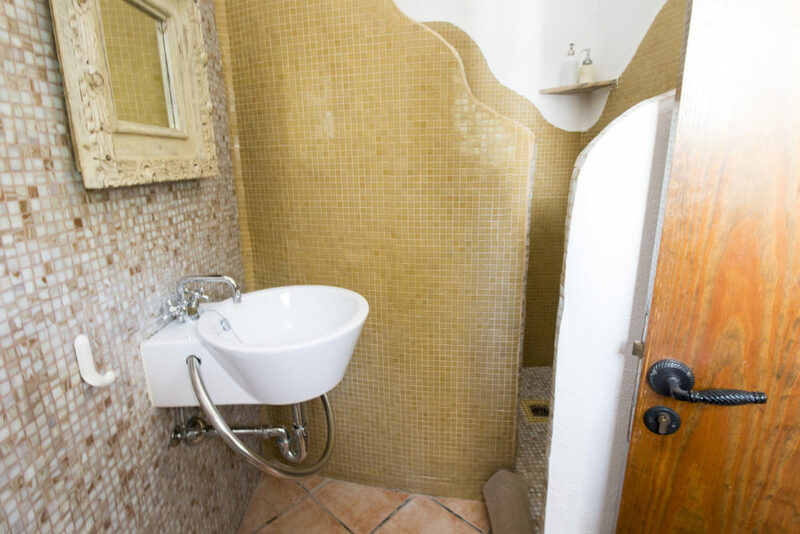 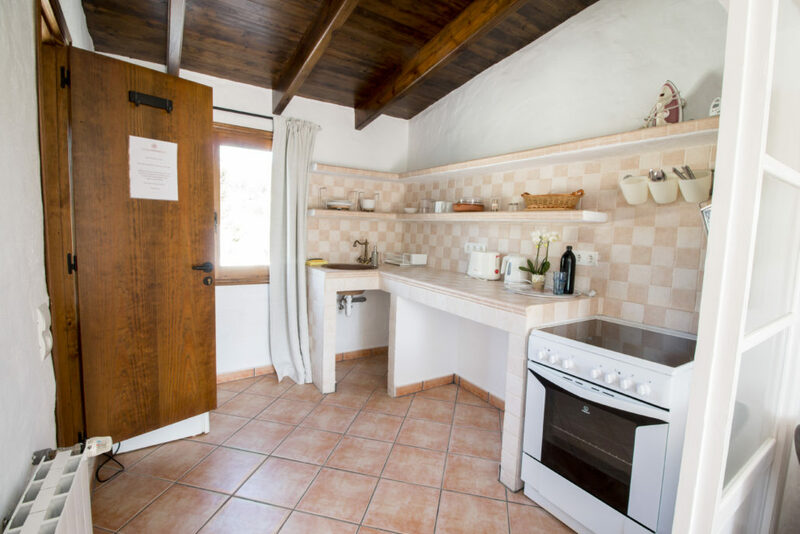 3 separate studio apartments – benefiting from their own entrance and mini kitchen, which is ideal for 2 people sharing who want more independence (malachite, amber and upstairs cielo with its own roof terrace). 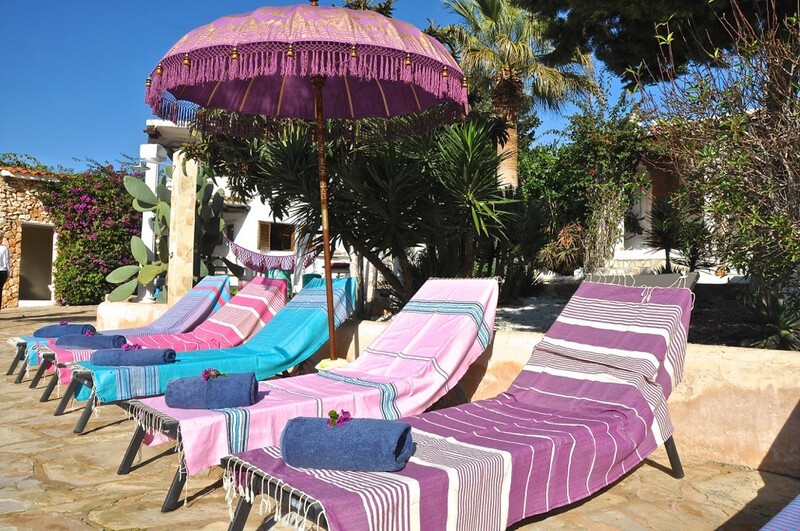 Maid service / house-keeping: There is a daily maid service / housekeeping from wonderful Oksana, Neyse and team who will put out all of the soft outdoor furnishings and dress the pool area, sweep inside and outside of all communal areas and make up all beds each morning between 9.15 and 13.45. 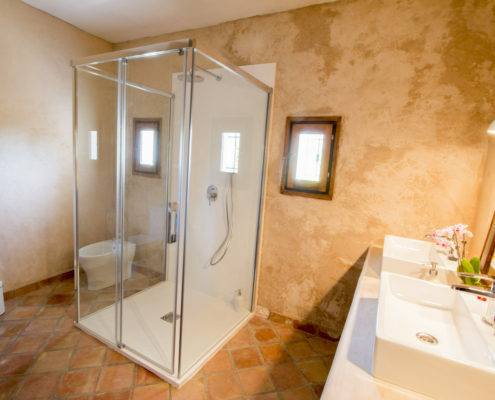 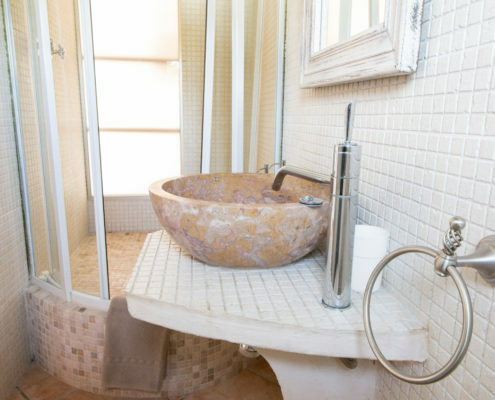 Your booking includes a deep clean at the end of your stay. 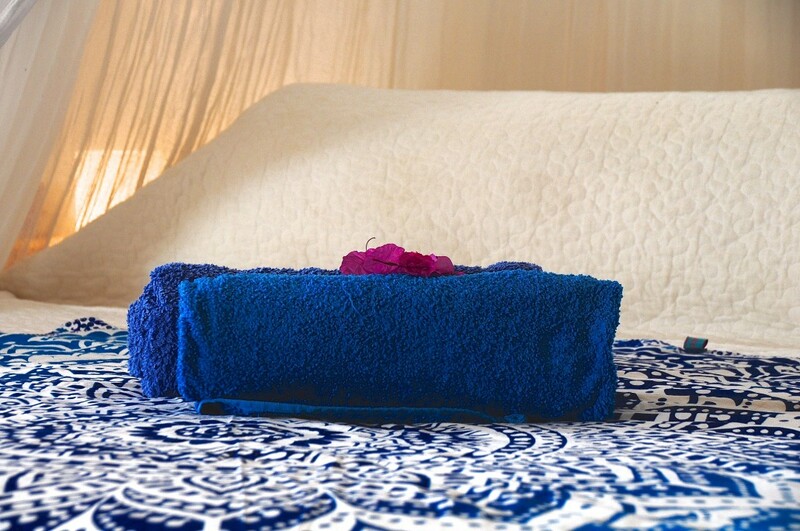 Arrival & departure times: are 4pm arrival and 10am departure Saturday – Saturday booking. 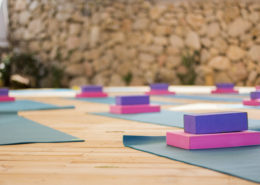 From the pool-garden, step through the door into the exquisite outdoor Yoga Garden, where the yoga deck for up to 20 x students and teacher is embraced by intertwining vines, providing a wonderful space to practice in the open air, with the pond full of lotus flowers and chirruping frogs, interplaying with the sweet sounds of birdsong. 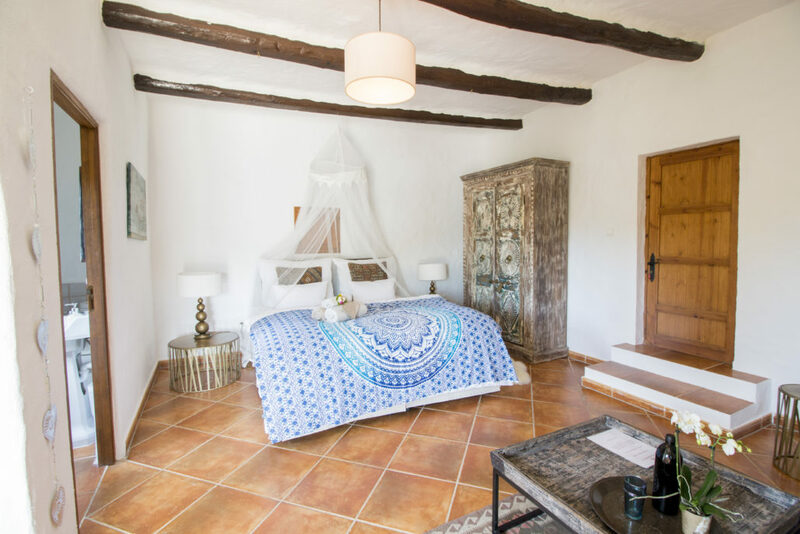 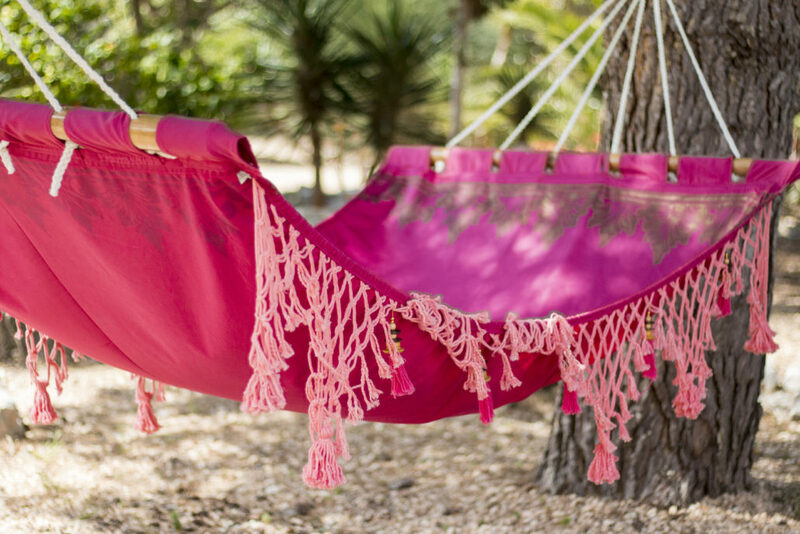 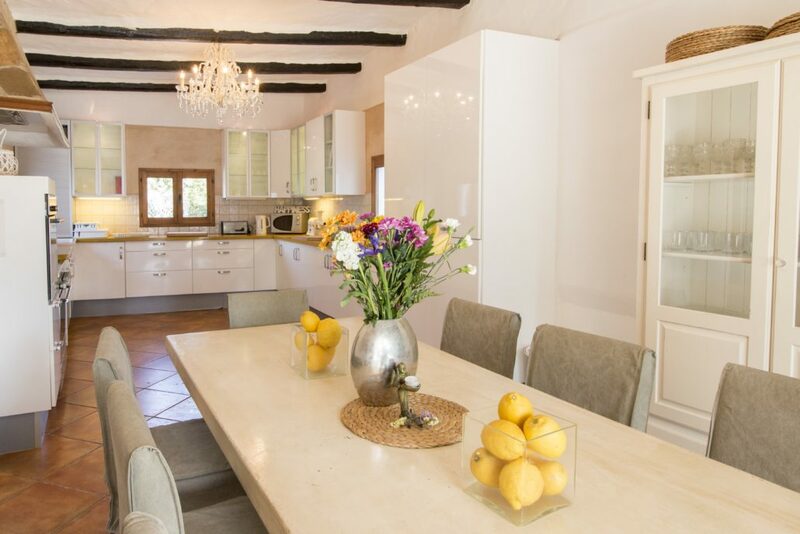 Enjoy the aromatic fragrance of the fruit trees in flower, pick a sweet Nispero fruit, or go for a wonderful circular walk around Casa Lakshmi through peaceful forests and past sheep grazing next to stunning Andalucian horses. 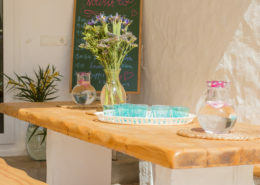 The inside living areas provide a huge kitchen, indoor dining for up to 30, a dedicated treatment or 1:1 consultation room, an office and a second sitting room, and even a ‘tea & juice bar’ space for your perfect break out times. 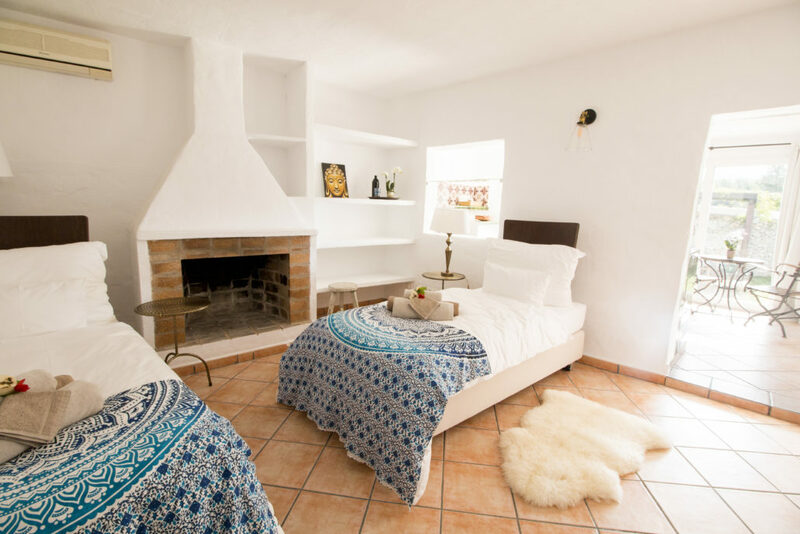 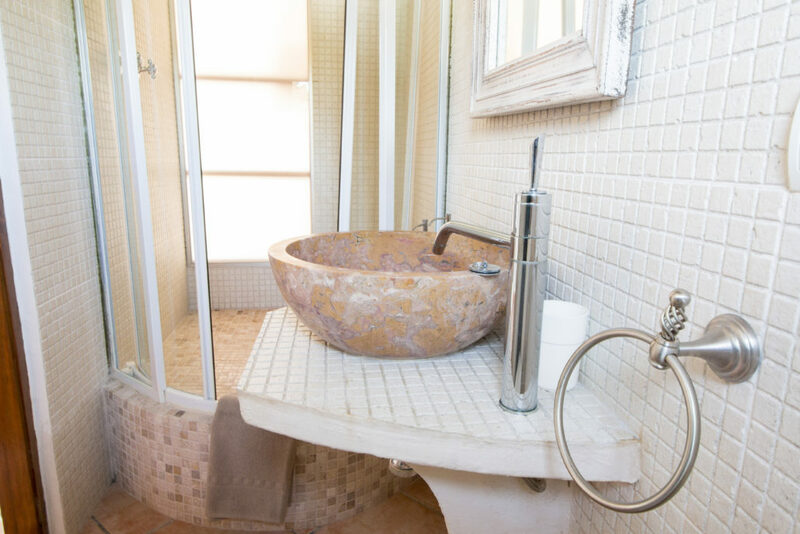 With central heating and classical estufa (log burning stove) to provide a cosy all-weather atmosphere, Casa Lakshmi is equipped for summer and/or winter. 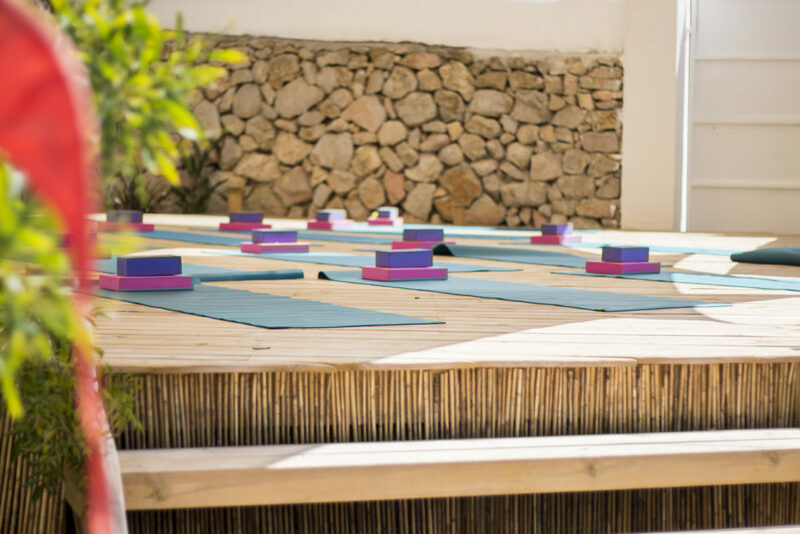 One of the few retreat locations in Ibiza where you can enjoy the magic of nature and also the warmth and intimacy of diving inwards, indoors. 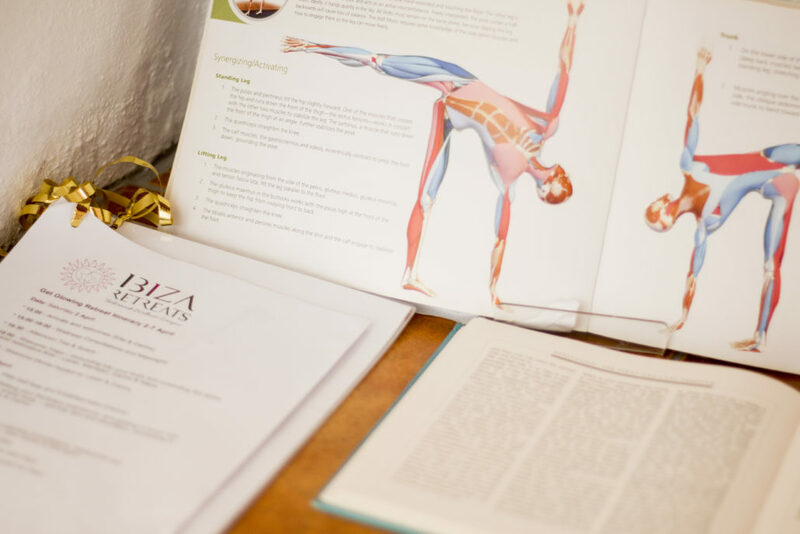 Whilst what we serve is predominantly vegetarian, with a recombination for gluten, dairy and sugar free, of course different needs can be catered for. 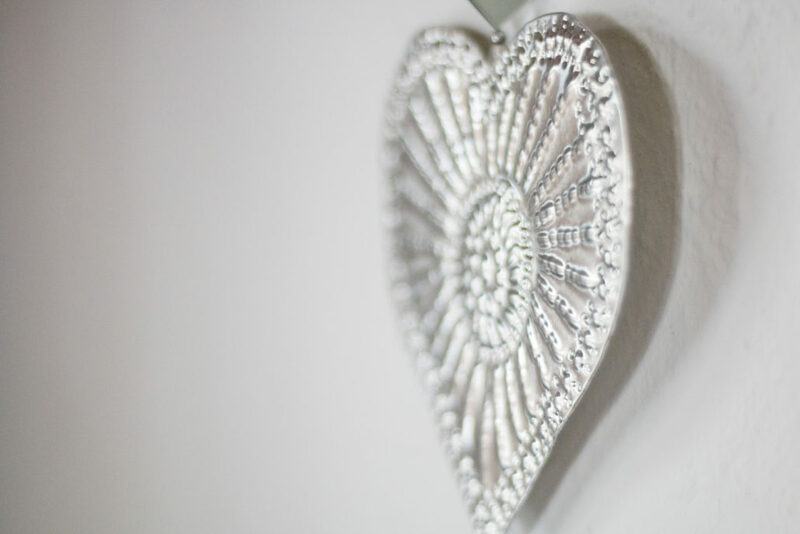 We have a wonderful house-carer in the very background, to ensure that all house-details can be swiftly and easily taken care of. 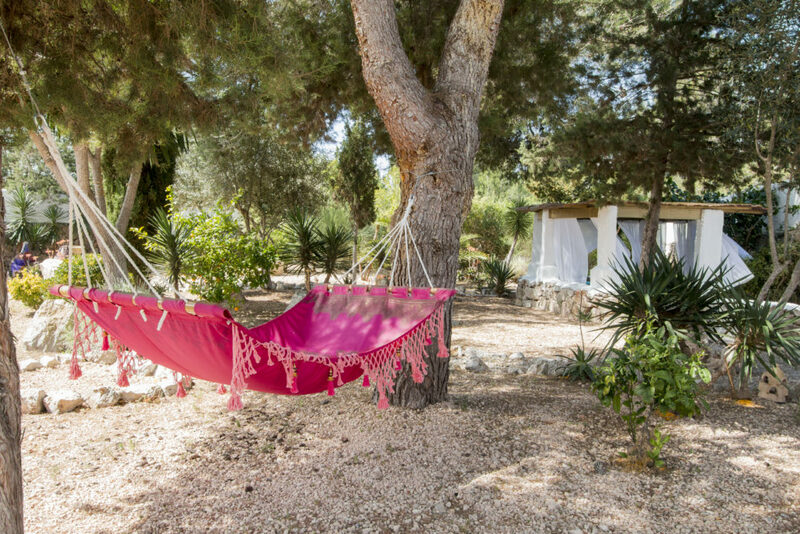 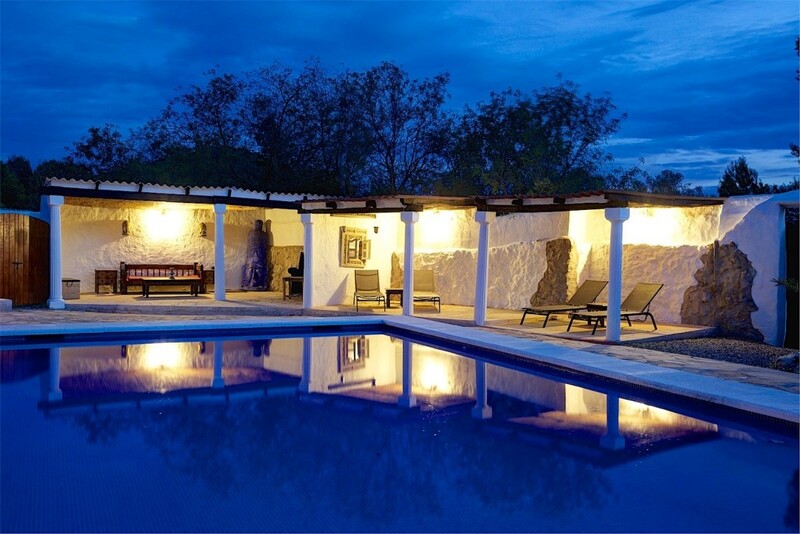 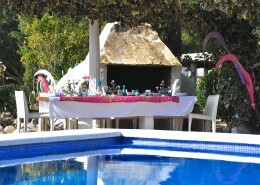 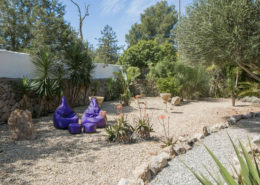 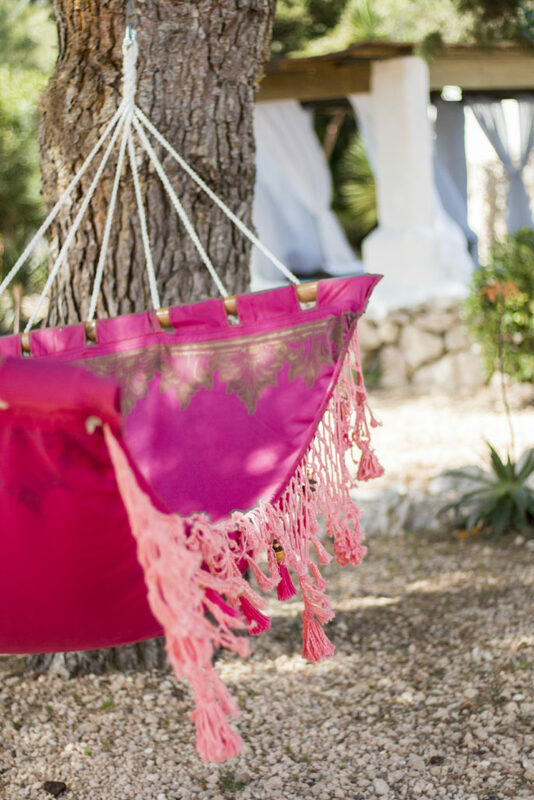 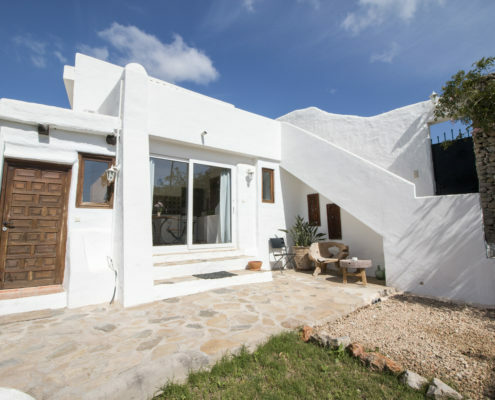 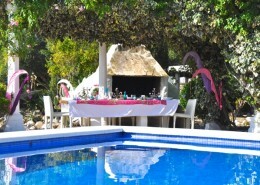 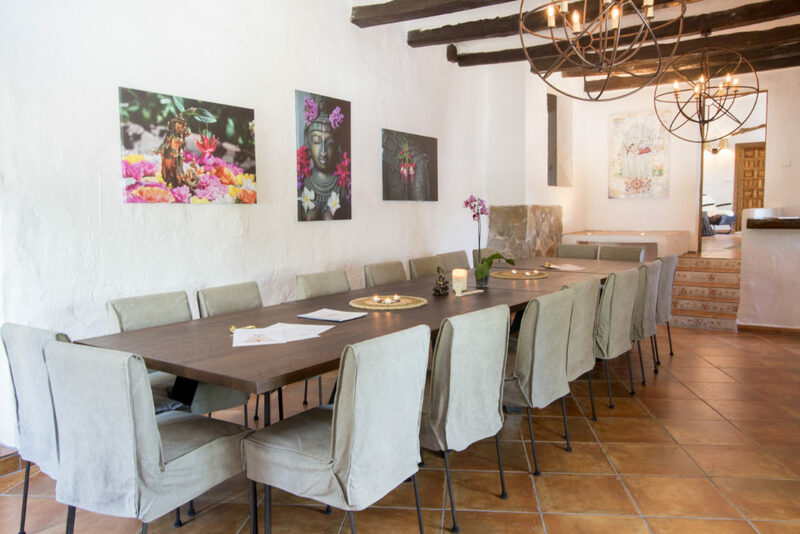 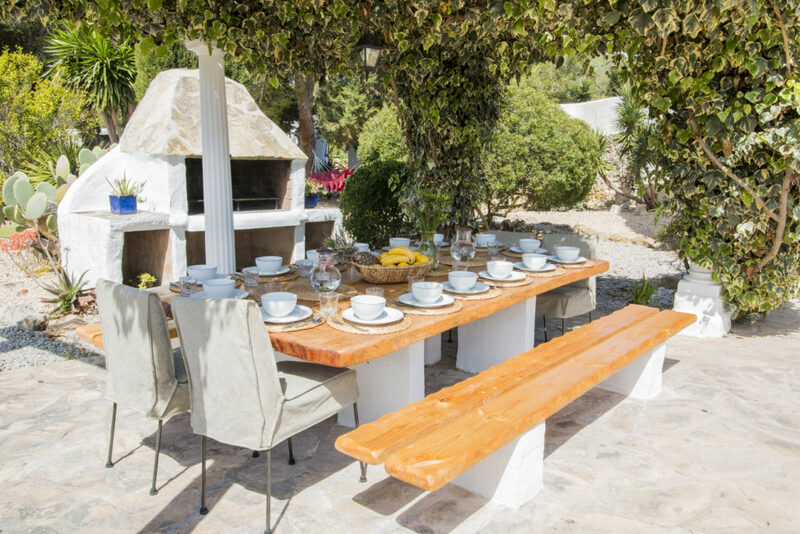 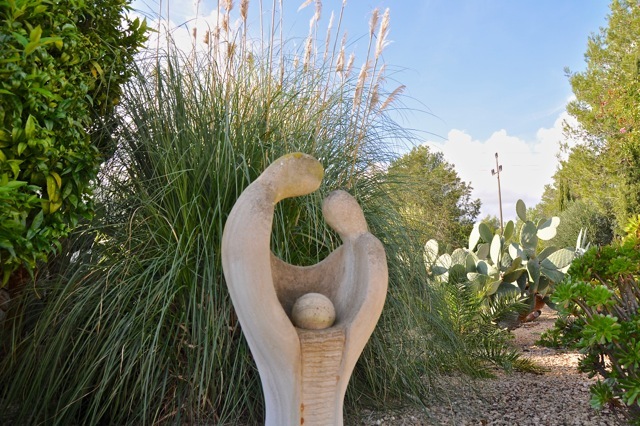 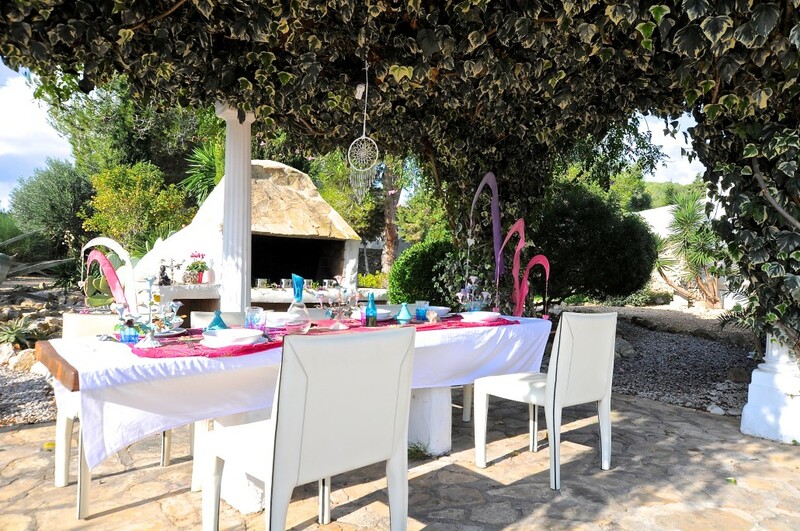 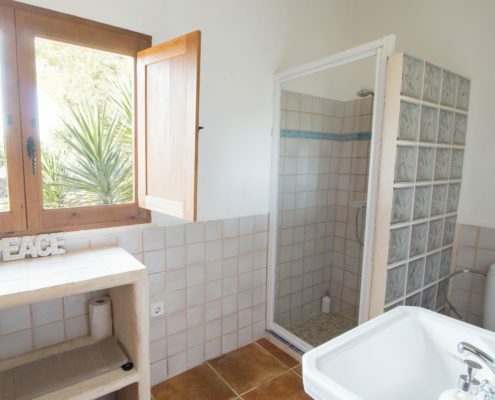 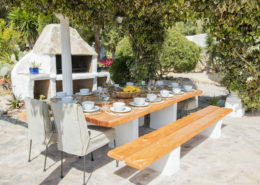 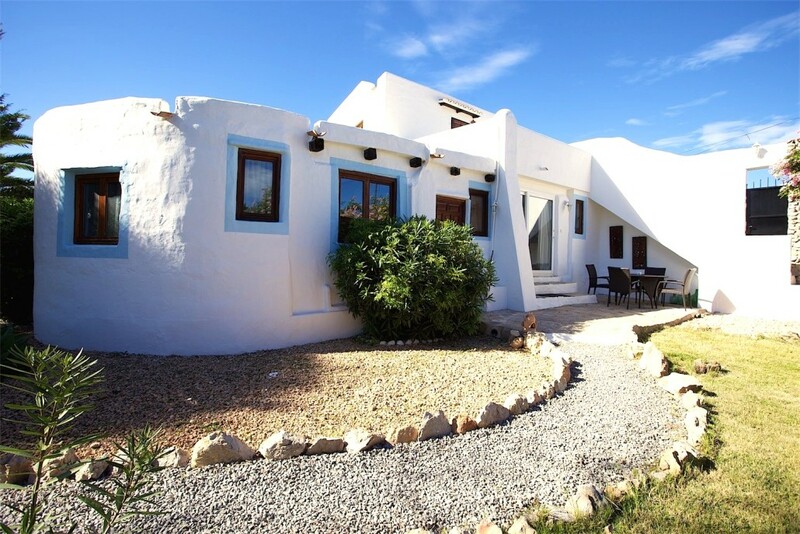 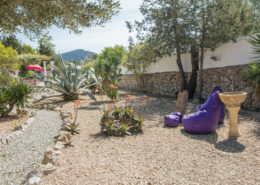 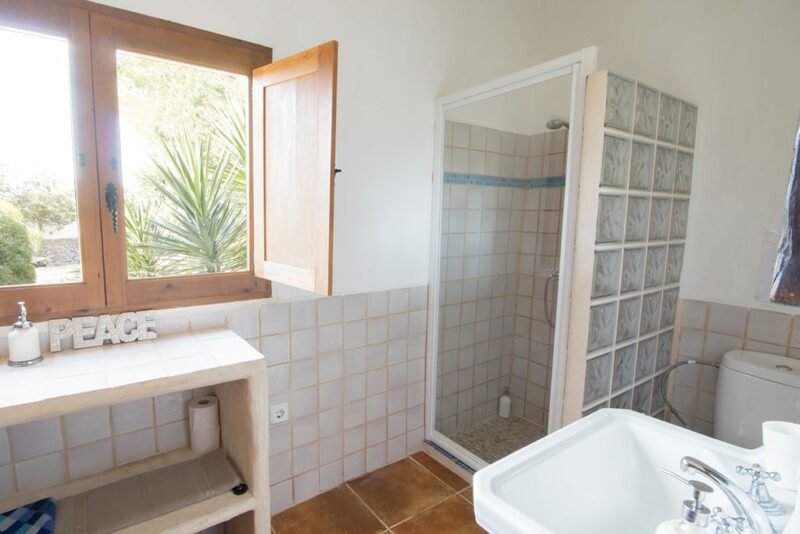 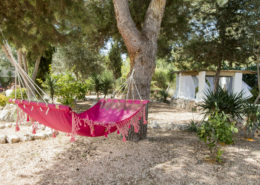 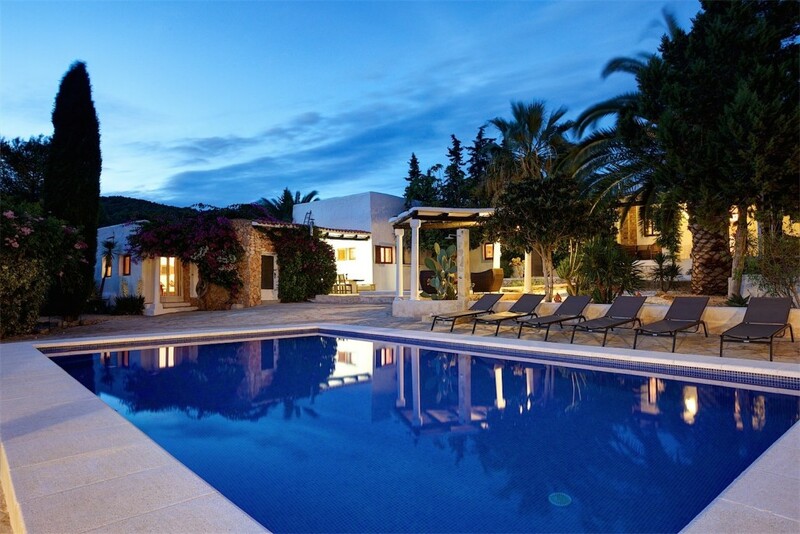 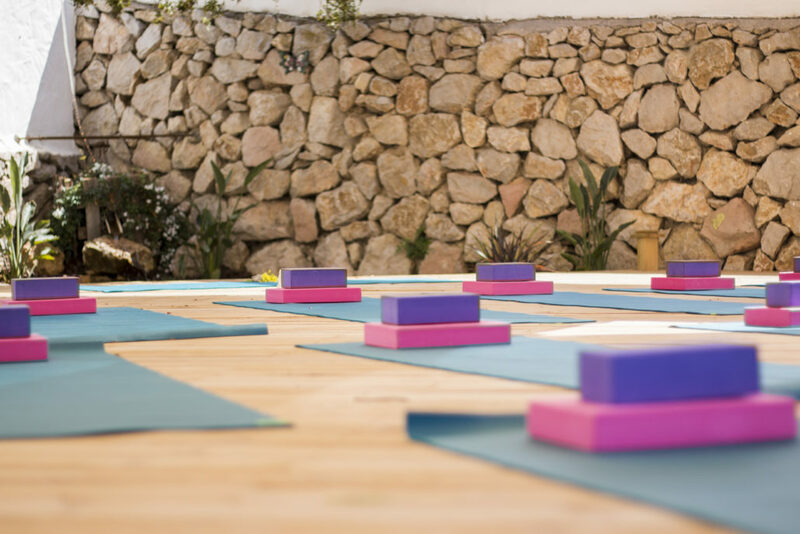 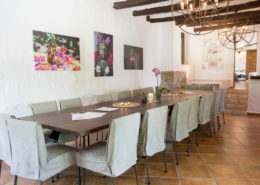 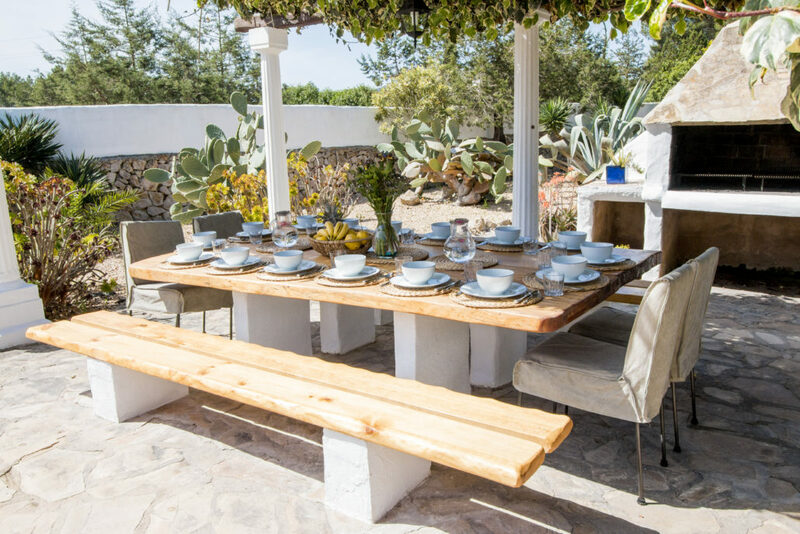 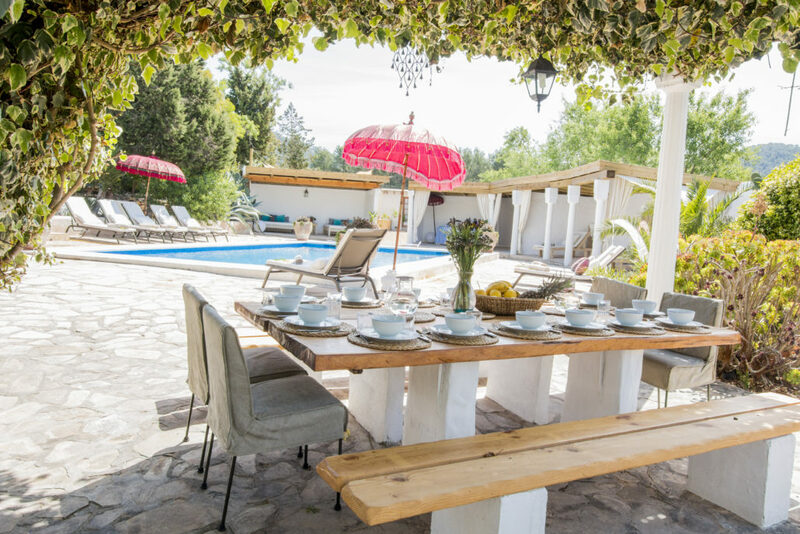 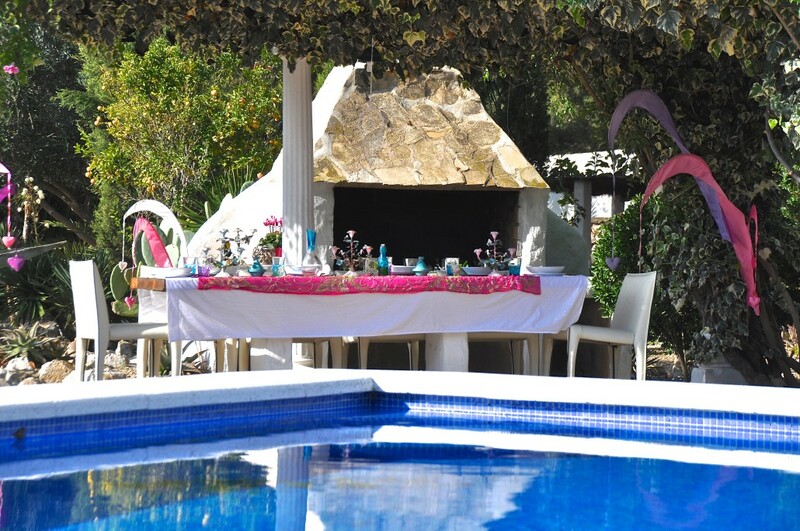 Our Ibiza Retreats office is in the casita in the back of the property, so during the day, Monday – Friday we can be reached if necessary, offering an extra sense of security for your group. 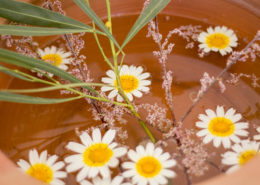 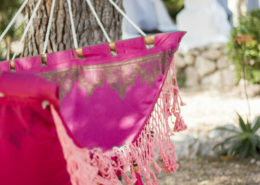 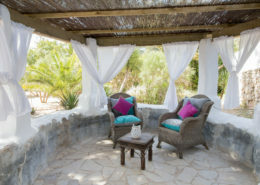 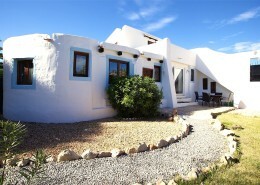 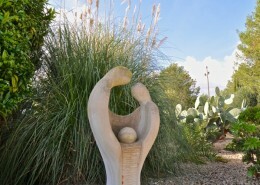 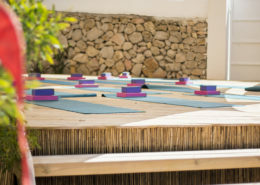 Ibiza Retreats can offer you extra hosting assistance at a small fee and our dedicated retreat manager will ensure you enjoy the finest, expert island guidance, tuning you in to the perfect places for sunrise yoga and sunset hikes and meditations at different times of year, ambient restaurants, hidden beaches and secret coves as well as magical energy spots around our beloved island. 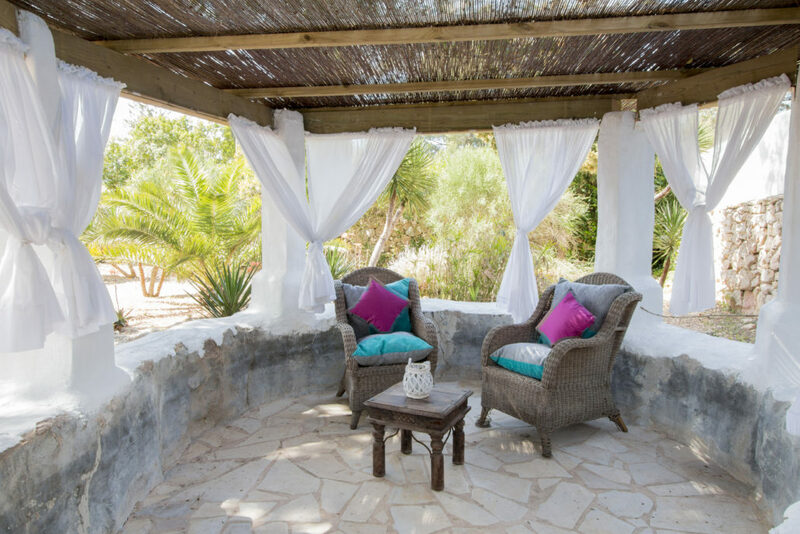 We also offer an island guide for your guests to find out about the places around the island we love the most. 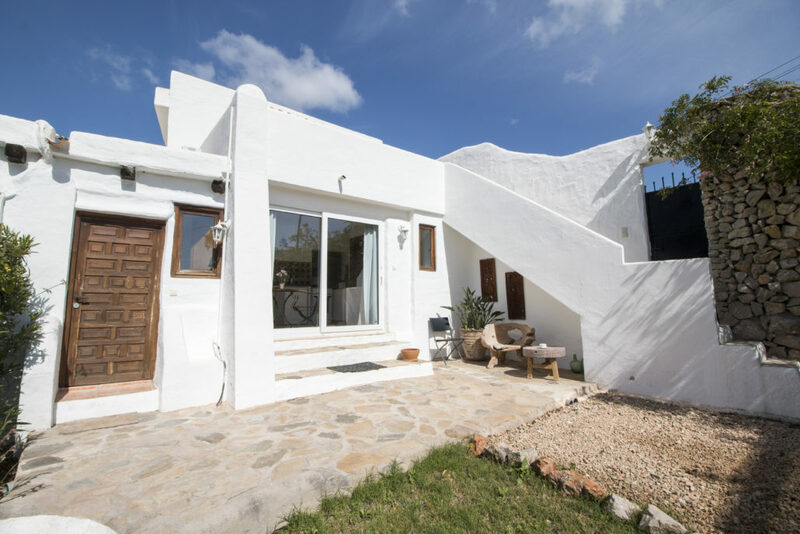 Although Cala Llonga & S’ol Den Serra beaches are about 30 minutes walking distance, we prefer the more rugged and natural Cala Nova, Cala Llenya, and further North amazing Aguas Blancas, Cala Martina and Pou des Leo. Please see our island guide for island-wide beach guidance! 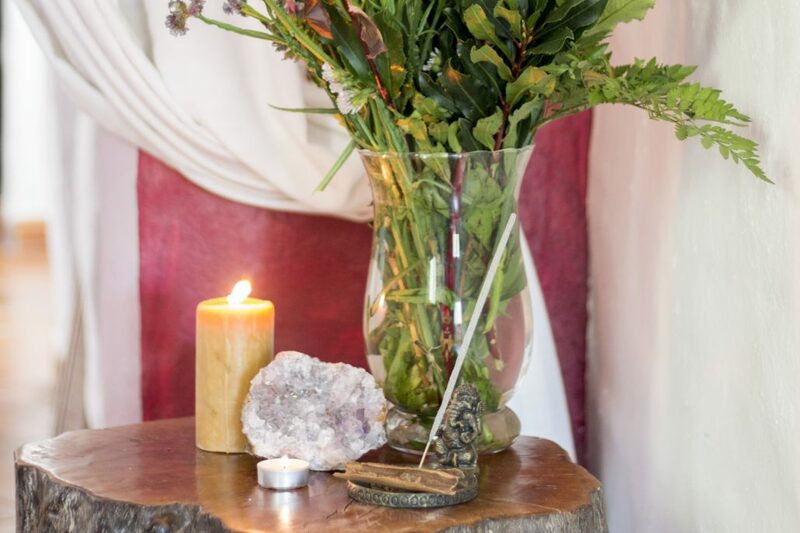 Can Muson organic farm and shop is just 4 minutes drive – out of the gates turn right, turn right onto the main road, drive between the carpenters warehouses and turn left, it is open 10am – 2.30pm Monday – Friday and from 10am on Saturday and Sunday. 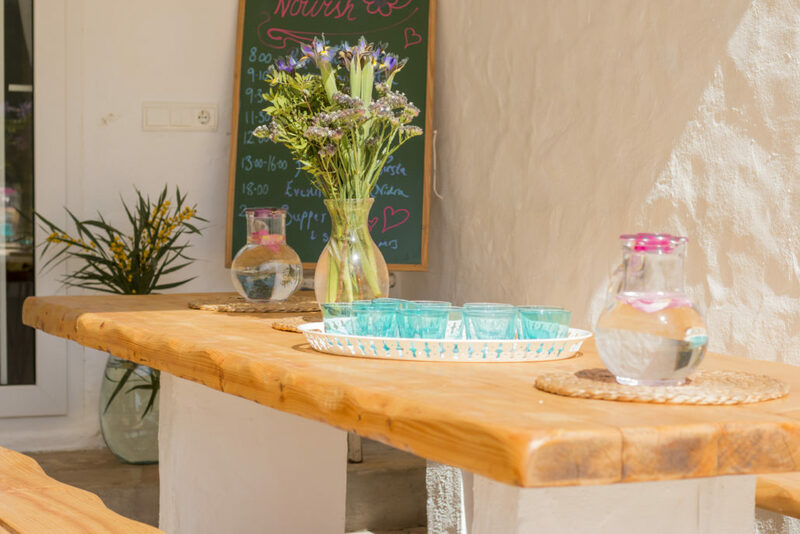 SUMA supermarket is open from 9am – 2pm and 5pm – 8pm Monday to Saturday and is also just 4 minutes drive, out of the gates, turn right and right again onto the main road, drive to the T-junction and turn left, SUMA supermarket is about 200 yards on your right hand side.